With a crank adjustment that lets you customize your ideal table height with ease, the Motor City Crank Height Table is sure to enhance your productivity and comfort. Position it at standing height, desk height, or anywhere in between — from 22½" to 33" (57 cm to 84 cm) high. The generously sized, 42" × 30" (107 cm × 76 cm) white melamine top also tilts from 0–45°, making this table ultra functional and versatile — ready for anything from drawing and drafting to doing computer work. 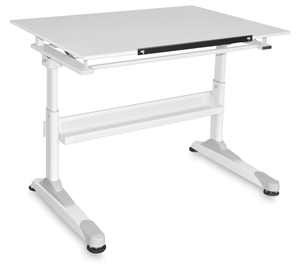 The metal frame has a scratch-resistant white enameled finish and a full-length stabilizer bar/shelf. Capped feet are designed to protect floor surfaces against scuffs and scratch marks.